Passiflora x 'Silly Cow' is a recently introduced hybrid from well-known passion flower breeder Myles Irvine. Named in honour of his friend Jana-Marie Štípská', the words 'Silly Cow' in this instance are used a term of endearment rather than a derogatory comment. While it is always an honour to have a new species or hybrid named after you I am not so sure that I would admit to this one. Growing both in my garden, I can say that my own 'Silly Cow' specimen starting flowering a good month later than the regular Passiflora caerulea, and only then sporadically, usually three or four blooms every couple of days. Each flower only lasts a day and while the flowers are indeed superior to P. caerulea, the lack of blooms means that it does not perform as well. Even though insect pollinators visited the blooms no fruits were set. Sadly stock of this gorgeous hybrid is few and far between, in fact I am only aware of two nurseries who can supply Passiflora x 'Silly Cow'. However as a specimen climber it is definitely one to consider. It is vigorous in growth and extremely floriferous, with 5 inch wide blooms emerging with a vengeance in June followed by a constant few until November. What really sets this cultivar apart is the pronounced navy-blue corona filaments which look almost jet black from a distance. To the artistically minded, they can take on the appearance of large, dilated eyes staring back at you. While the parentage of Passiflora x 'Silly Cow' appears to be a closely guarded secret you can't deny that it looks like a Passiflora caerulea on steroids, which is kind of what it is. While regular species of passionflower contain two sets of chromosomes, Passiflora x 'Silly Cow' is listed as being a polyploid complex. This means that it is a hybrid of interrelated and inter-breeding plants with chromosomes numbering more than 2 per cell. 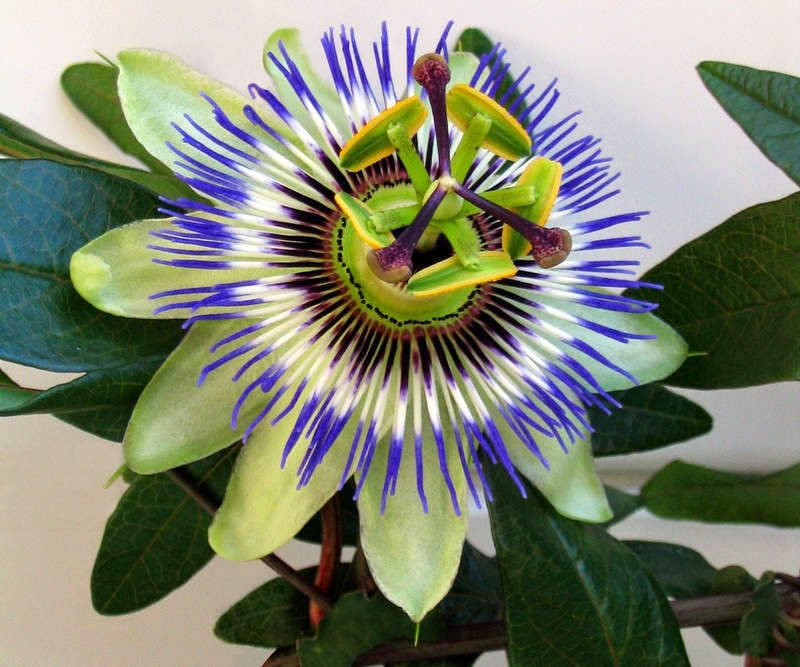 Polyploid plants tend to be sterile which would explain why Passiflora. 'Silly Cow' rarely sets fruit. Be that as it may the plant itself is as tough as old boots able to withstand winter temperature down to -8 degrees Celsius. Grow Passiflora x 'Silly Cow' outside on a sheltered, south or west warm wall. The top growth can be damaged by seasonal frosts, but new stem will arise from older wood in the spring. 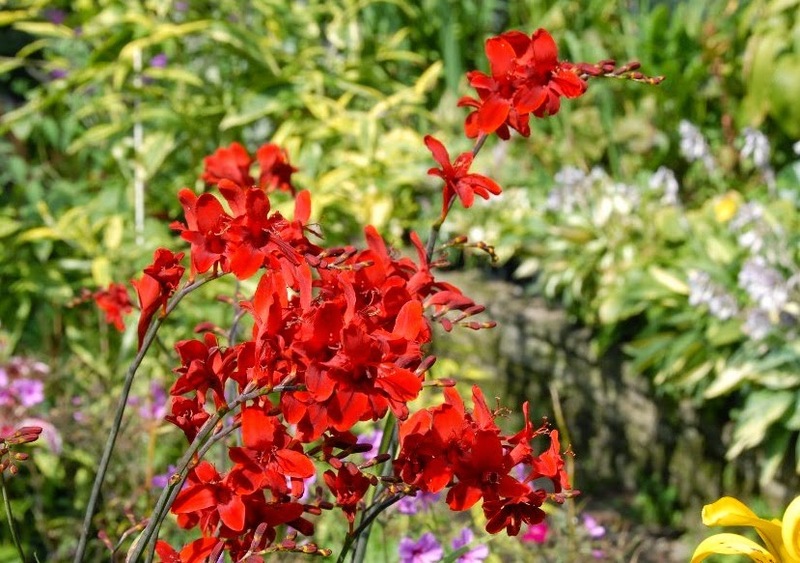 It can be grown in any ordinary, well-drained soil in full sun or partial shade. In colder areas of northern Europe it may be worth protecting Passiflora x 'Silly Cow' with brushwood or polythene sheeting for the first year or two until it becomes established. In February or March, thin out any overgrown vines back to ground level or to a main stem. Spur back lateral shoots to 6 inches at the same time. 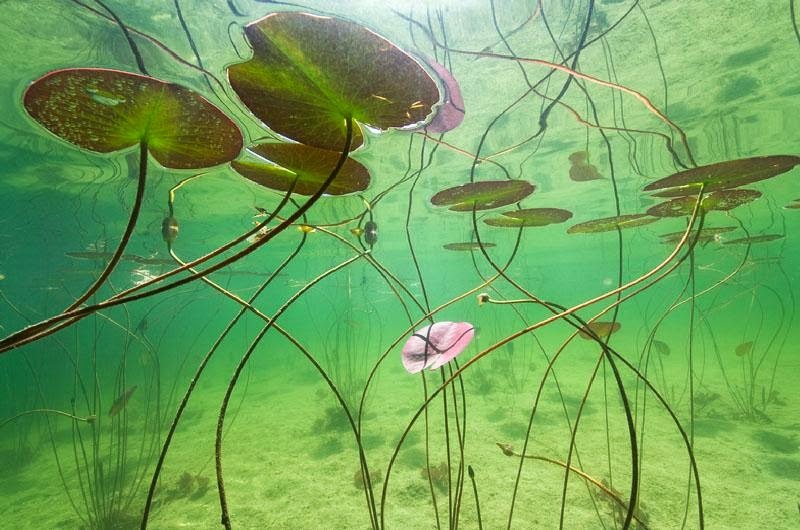 Water lilies are an aquatic plant commonly found in ornamental ponds. They will grow in fertile loamy soils with seldom need any additional need for fertilizer. If the soil is light or of a poor quality clay, either incorporate a layer of decayed cow manure or mix in an organic fertilizer at a a rate of 10 grams per 10 litres volume of soil. Course bonemeal is particularly suitable for this purpose. Water lilies can either be planted directly into the base of the pond or, in the case of pre-formed or flexible liners, a perforated container. 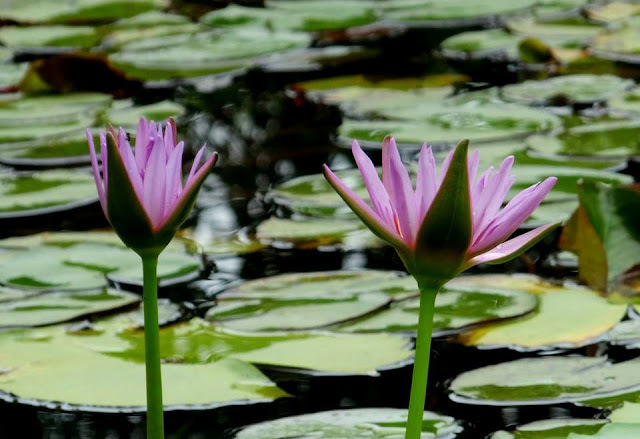 In either case, large plants will need soil 8-12 inches deep, medium specimens 6-8 inches deep, small varieties 4-6 inches deep while miniature water lilies will only require soil that is 3-4 inches deep. 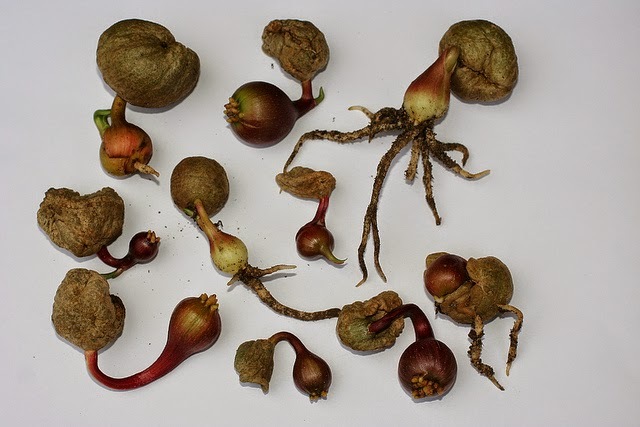 Plant newly propagated tubers or rhizomes between mid April and early June, setting them so that the soil is level with the young, growing part of the root-stock. When placing in their new setting, keep the water as clear as possible to allow light and warmth to penetrate and encourage new growth. When planting direct, reach down through the water and push the rootstock into the soft mud. Alternatively, in large ponds only, strip the grass from a suitably sized turf, roll the rootstock inside with the crown exposed, secure with a section of jute string and carefully lower into position. 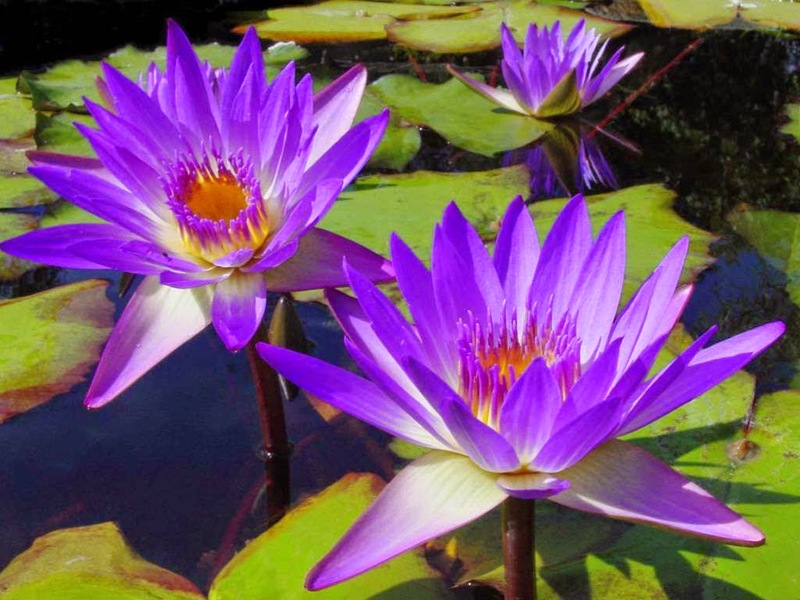 Water lilies require little attention after planting. However excessively large leaves may be removed from established plants if desired. Prolific varieties and those in small pools may need thinning from time to time. April or may are the best time for thinning. After draining the water or lifting the containers, examine the rootstock and select one of the strongest rhizomes or tubers.. Using a sharp, strong knife, sever this 6-8 inches back from the growing part and trim off the true roots beneath These sections of the rhizome can be replanted. If the pool is being planted at this time, store the rhizomes temporarily in a box covered with wet sacking or paper and place in the shade. If you live in a northern European climate but desire the escapism of a tropical effect garden then one of the key factors required to create this illusion is the usage of large leaved plants. Living as I do in the south of England I am blessed with a slightly milder climate than the norm for Great Britain, however I have seen successful tropical effect gardens as far north as the midlands. The secret to this is to create a microclimate, the details for which will need to be pursued in another article. I have created a list that comprises of the largest leaved plants that can be grown in Great Britain, as well as a couple of less hardy that will need to be treated as annuals and a few that just incredibly evocative of the tropics. This is the largest leaved plant that you can possibly grow in Great Britain. Native to South America from Colombia, the leaves of the giant ornamental rhubarb can grow as large as 11 ft in diameter given a wet summer. The underside of the leaf (including the stalk) is covered in spikes. In early summer it bears tiny red-green flowers in conical branched panicles, followed by small, spherical fruit. However, if you allow the rather ugly flower spike to bloom the gunnera will stop producing leave until flowering is over. Removal of the flower spike at an early age will ensure further leaf production. Not as well known as the Gunnera and prone to suckering, Tetrapanax rex. Native to Taiwan, it is undoubtedly one of the most architectural, hardy, exotic plants possible to grow here in the U.K. In milder regions it can be almost be considered evergreen but further north it will need to be treated as a deciduous shrub, hardy in most regions. In particularly cold areas it is worth protecting the trunk in winter with straw or fleece. Now this one is a bit of a cheat as the leaves of the Paulownia tomentosa are only about 16 inches across. 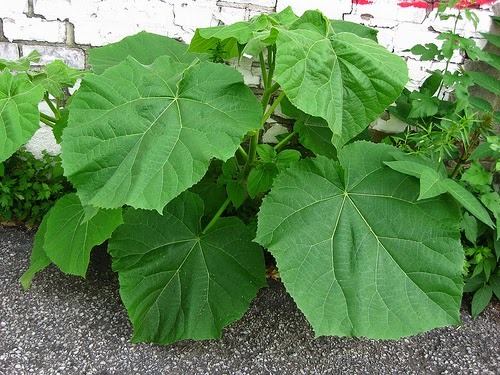 However the young growth of Paulownia tomentosa (otherwise known as the foxglove tree) exhibits uncharacteristically large leaves and this can be exploited by pollarding the tree and ensuring there is vigorous new growth every year. 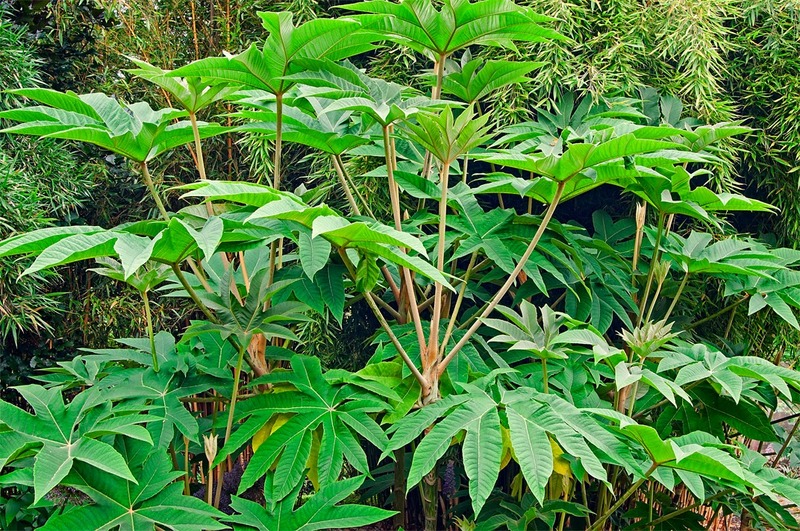 Using this technique, massive leaves are produced which can be as large as 30 inches across. 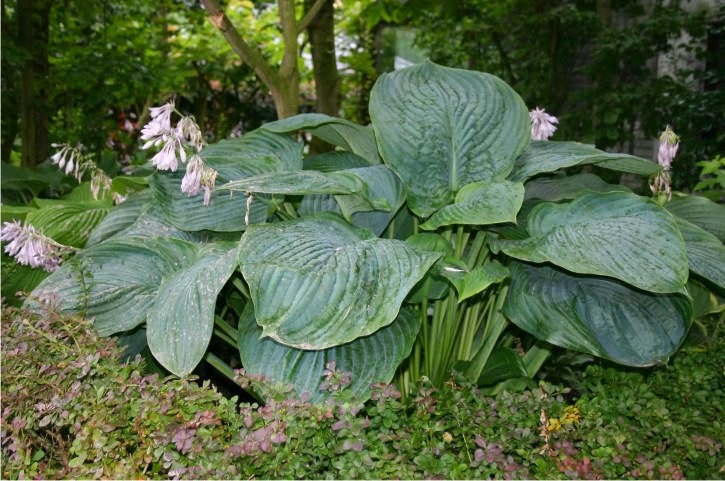 Hosta are well known for their large heart-shaped leaves and come in such a large variety of sizes and colour forms that there is one for almost every need. There are plenty of giant leaved hostas to choose from although they are rarely seen in your typical garden centre rare, however the largest leaved hosta ever introduced to commercial production is Hosta 'Empress Wu'. This is a massive specimen with deeply-veined, dark powder blue leaves that can measure a rediculous 28" long by 25" wide! This extremely large hosta will grow up to 5' tall and 8' wide, but there are many other, slightly smaller forms that you can choose from. 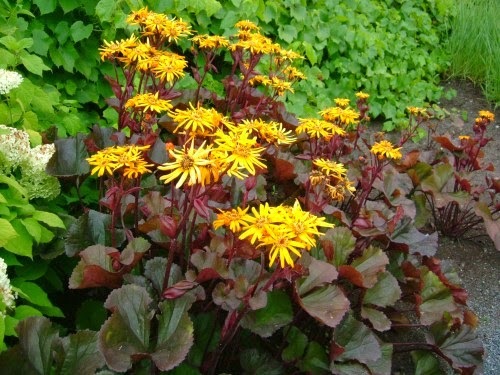 Ligularia is an often overlooked genus of robust Old World herbaceous perennial plants which are native to damp habitats mostly in central and eastern Asia, although there are a few species from Europe. Fatsia japonica is a species of glossy-leaved, flowering plant native to southern Japan and South Korea. Suitable for both sun and shade, this evergreen shrub is a particularly handsome specimen that can grow up to 20ft tall, with stout, sparsely branched stems. The leaves are eight-lobed and palmate and are also available in a number of stunning cultivars. 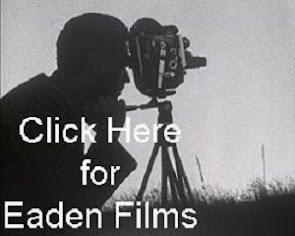 perhaps the most exotic is the recent 'Spiders Web' introduction. Commonly known as the Chusan palm, Trachycarpus fortunei is one of the hardiest true palms that can be grown in Great Britain. Native to central China, south to northern Burma and northern India. It is a fan palm with the leaves that can be as long as 75 inches! While slow growing, given enough time it will eventually reach a height of up to 60ft tall. It is quite happy growing in cool, damp conditions and records have shown that individuals will tolerate temperatures as low as −27.5 °C. However, lower tolerance limits of −15 °C to −20 °C are cited for mature plants. Young plants are less hardy, and can be damaged by only −8 °C. Also known as Jelly Palm, Butia capitata is notable as one of the hardiest feather palms, tolerating temperatures down to about −10 °C. It will grows to around 6 metres tall, sometimes larger, but in a slow and steady manner. It is easily identifiable by its feather palm pinnate leaves that arch inwards towards a thick stout trunk. Native to South America, the name Jelly Palm relates to the edible fruit flesh which is fibrous, sweet and taste similar to apricots. The fruit is sometimes made into a sweet jellies and jams. 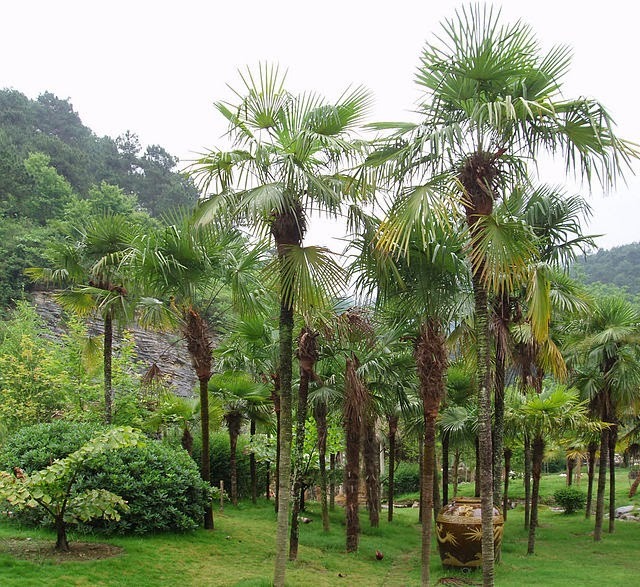 Known as the European fan palm, Chamaerops humilis is the only palm species native to continental Europe. It is the northernmost naturally occurring palm in the world, eventually reaching 2–5 m tall. It is adapted to a Mediterranean climate with cool, moist winters and summer drought, and will even grow on poor, rocky soils. 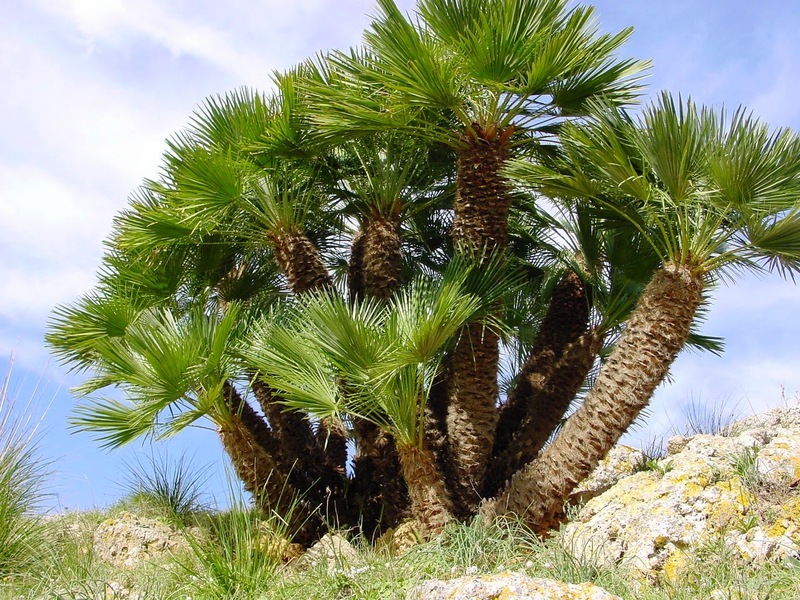 It is one of the hardier palms available, able to tolerate temperatures down to about −12°C. 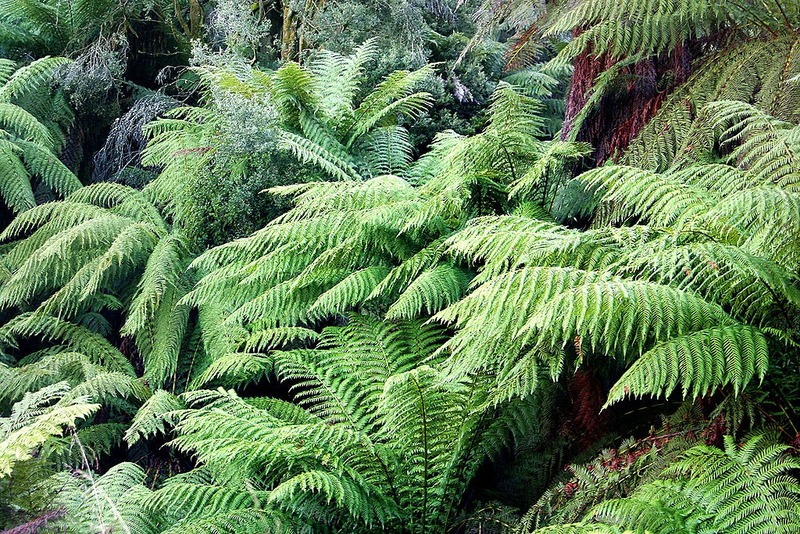 It will grow even in climates where the summer temperatures are no higher than the low 20's C.
Dicksonia antarctica is a species of evergreen tree fern native to parts of Australia and Tasmania. 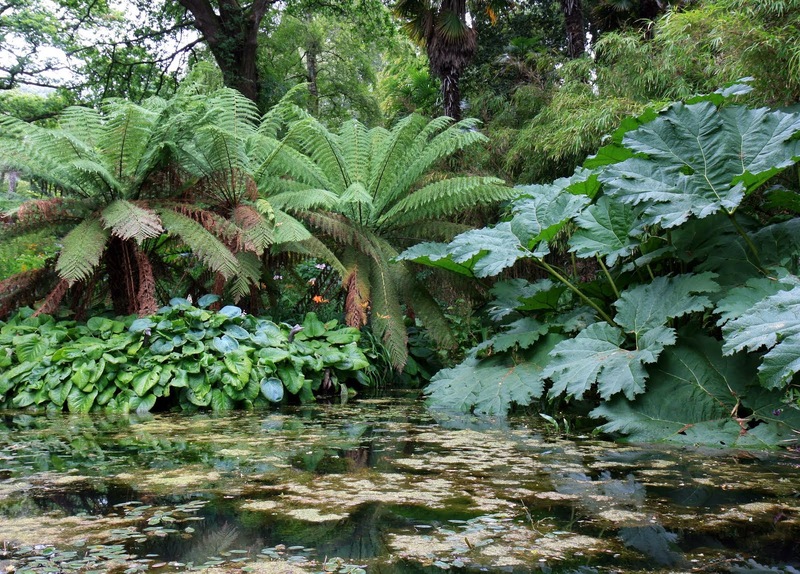 They can grow to 50 ft tall in their natural habitat, but in northern European gardens you can expect around 15–20 ft. They are extremely slow growing at a rate of 3 to 5 cm per year, and only then if they are kept in optimum condition. With this in mind always purchase the largest specimens that you can afford. They will do best on damp, sheltered woodland slopes and moist gullies, but so long as you can supply enough water they will grow anywhere including full sun. There are plenty of large leaved ferns out there but the largest is the outrageously impressive shuttlecock fern - Matteuccia struthiopteris. Native to the temperate regions of the Northern Hemisphere, it requires permanently moist, humus-rich soil in dappled shade. The deciduous green fronds are almost vertical, growing up to 70 inches tall. 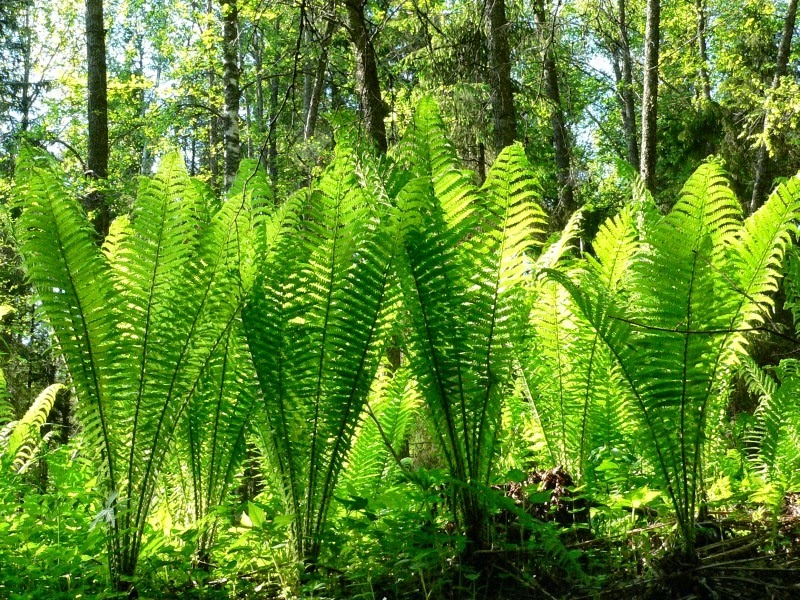 They are long-tapering to the base but short-tapering to the tip, so that they resemble ostrich plumes, hence their other common name of ostrich fern. 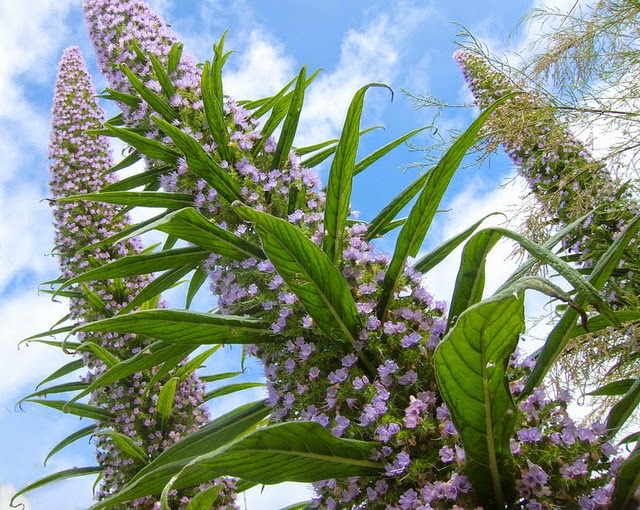 Commonly known as the Tree Echium, Echium pininana is a biennial or triennial plant, native to La Palma in the Canary Islands. Its natural habitat are laurel forests, where it is now endangered through habitat loss. It is surprisingly hardy and produces one of the world's largest flower spikes reaching an over height of between 4-5 metres. 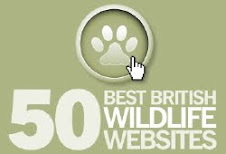 It outrageous size now means that is becoming a common sight in the gardens of Britain and Ireland. Be aware that they are susceptible to wind damage so a sheltered garden position is essential. To be on the safe side employ a sturdy stake once they exceed 2 meters in height. 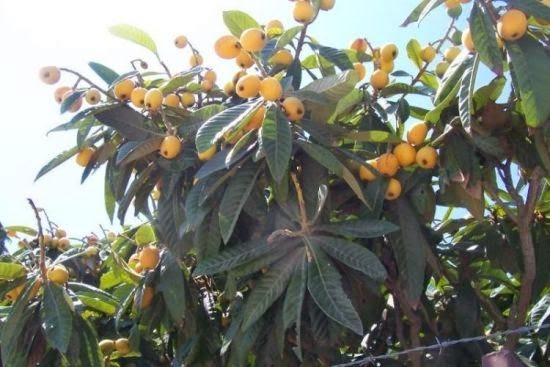 Commonly known as the loquat, Eriobotrya japonica is a species of flowering plant native to south-central China. It is a large evergreen shrub or small tree grown for its ornamental habit and large glossy leaves. It is also produced commercially for its yellow fruit. The leaves are between 4–10 inches long, dark green, tough and leathery in texture, with a serrated margin. They also have a coat of dense, velvety hairs on the underside of each leaf. The young leaves are also densely hairy on the upper surface, but this soon rubs off. You will know Ficus carica better as the common fig. Native to the Middle East and western Asia, is widely grown throughout the temperate world, both for its fruit and as an ornamental plant. It is a large deciduous shrub with bold, deeply lobed leaves. It grows wild in dry and sunny areas, with deep and fresh soil, and can reach a considerable size when mature forming a large dense shade tree. 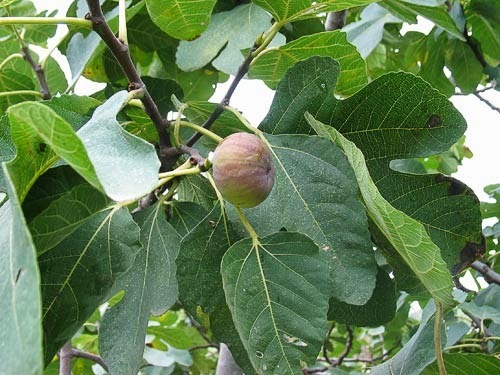 Not all Ficus carica varieties are hardy enough for outdoor cultivation in northern Europe but 'Brown Turkey' has proven itself to be a prolific and reliable variety. It is a drought tolerant species once established and will require a position in full sun. Hedera colchica is a species of ivy native to the Near and Middle East. 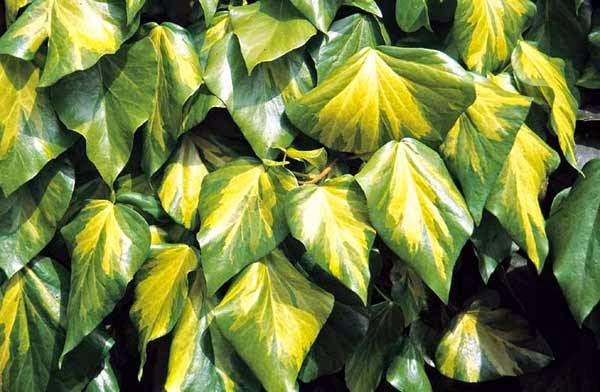 It is commonly called Persian ivy and is an evergreen climbing plant growing to a height of 30 metres where suitable surfaces exist. It is extremely tough and adaptable, preferring a well-drained or alkaline soils rich in nutrients and humus with good water provision. Like many climbing plants, it prefers its roots in cool shade with its stems in full sun. Commonly known as the Crimson Glory Vine, Vitis coignetiae is native to the temperate climes of Asia, where it can be found in the Russian Far East, Korea and Japan. 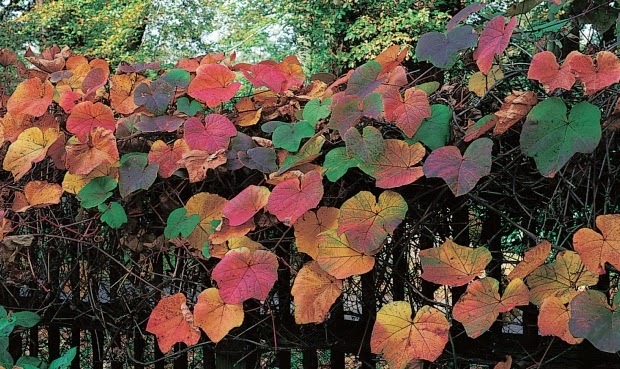 It is a very vigorous vine with purple shoots, but its most defining feature are its large, deciduous leaves which can be 12 inches or more in diameter and turn an attractive scarlet and crimson colour in autumn. 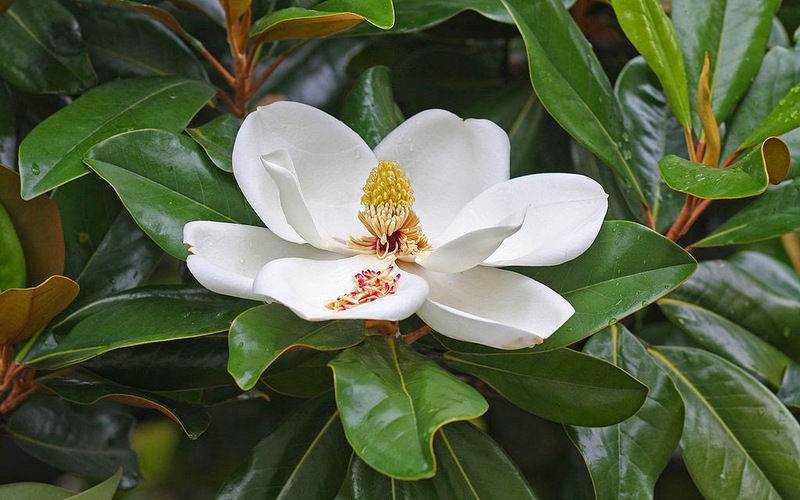 Magnolia grandiflora, commonly known as the southern magnolia or bull bay, is a medium to large evergreen tree which can grow up to 90 ft tall. 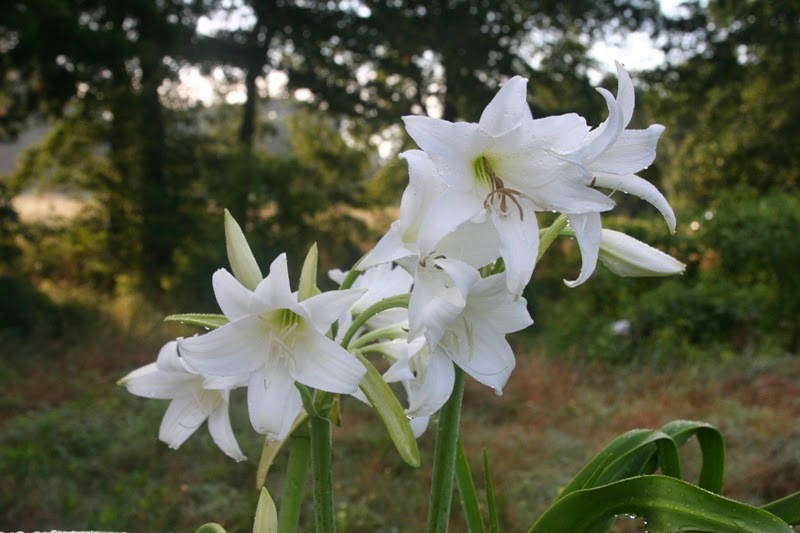 Native to the southeastern United States it is a large specimen with large dark green leaves up to 8 inches long and 4.5 inches wide and large white fragrant flowers up to 12 inches in diameter. The leaves are dark green, stiff and leathery, and often have a yellow-brown pubescence underneath. Grow Magnolia grandiflora in moist, well-drained preferably neutral to acid soil in sun or part shade. Unlike many other magnolia species it will tolerates dry, alkaline soil. Musa basjoo is a hardy species of banana native to southern China. It is a herbaceous perennial with a trunk-like pseudostem and can grow to an overall height of around 20 ft tall. It produces a crown of mid-green leaves which can grow up to 7 ft long and 30 inches wide when mature. Although the pseudostem can only cope with a few degrees below freezing, the root system is considered cold hardy. If it is well insulated with a thick mulch, it can tolerate temperatures down to −12 °Celsius. 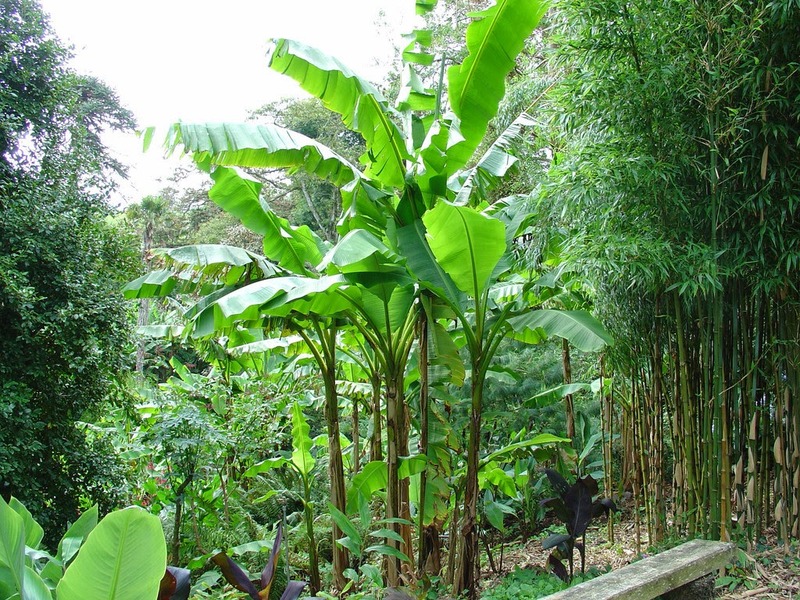 If the pseudostem is killed, the plant is not dead as the banana will resprout from the ground and can rapidly grows to full size in a single season under optimal conditions. Protection from strong winds will prevent tearing of the potentially massive leaves. Also called the Darjeeling Banana, Musa sikkimensis is a native to Bhutan and India and is one of the highest altitude growing banana species. It is a robust specimen growing to about 4 m tall with a yellowish-green foliage and reddish tinged pseudostem. 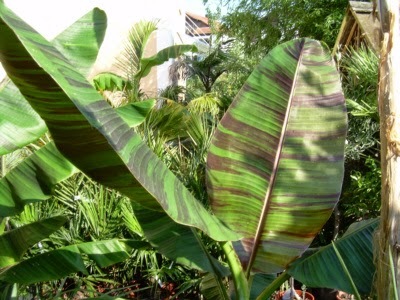 Its is one of the most ornamental of the banana family and second only in hardiness to Musa basjoo. 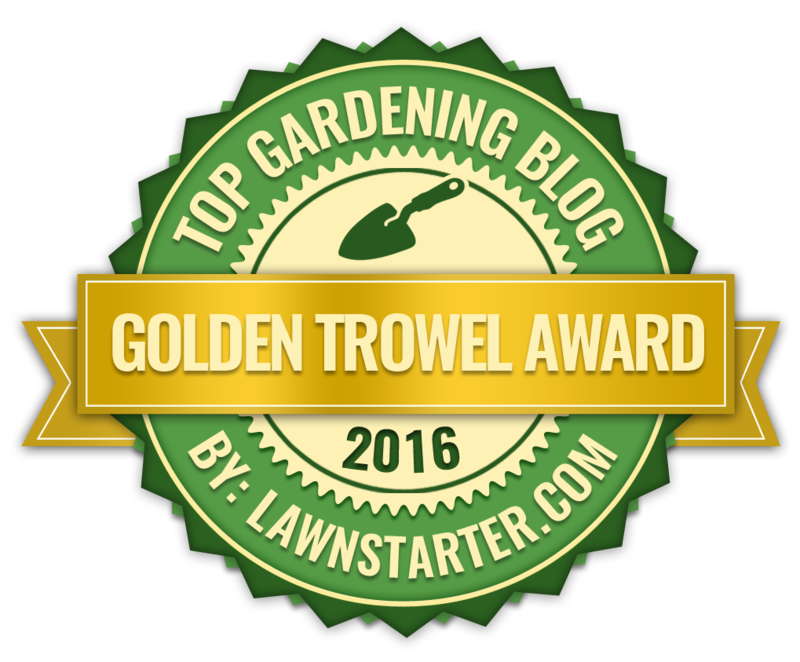 Water well during the summer months and provide plenty of well-rotted garden compost or farmyard manure. Zantedeschia aethiopica is a deciduous perennial (evergreen in mild areas) that grows to 1m in height, with rich green, arrow-shaped leaves. Native to southern Africa in Lesotho, South Africa, and Swaziland, it is usually found growing in streams and ponds or on the banks. It grows to 2–3 ft tall, with large clumps of broad, arrow shaped dark green leaves up to 18 inches long. Plant in full sun. WHAT IS THE WORLD'S LARGEST LEAF? 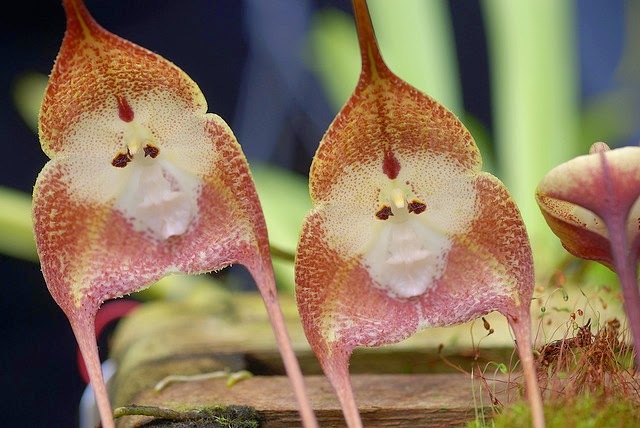 Monkey faced orchids are some of the most intriguing and captivating ornamental flowering plants that money can buy. And why wouldn't they be when they are one of the few plant genera than can look back at you when you look at it! 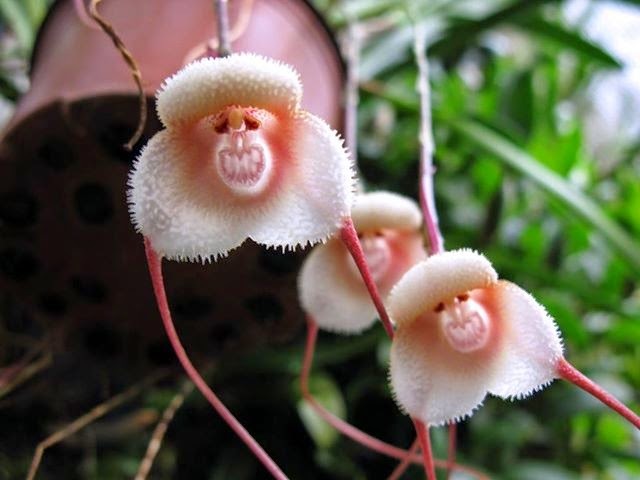 Of course the opportunities to purchase such as coveted specimen are few and far between and therefore many would-be collectors turn to the web to purchase monkey face orchid seed. Unfortunately there are a number or unscrupulous traders who are advertising monkey face orchid seed for sale, and sadly what they dispatch is not. This is a blatant scam. Furthermore orchid seeds are extremely small, ranging in size from nearly invisible dust-like particles and up to the size of pin pricks. Anything larger and they are not orchid seed. To clarify, orchid seeds are usually purchased as seed pods or by weight so anyone claiming to sell 5 or even 50 orchid seeds is probably lying. The seeds of most orchid species are far too small to count out in this manner. There is a bigger problem as you cannot simply pot on and grow orchid seeds like you would with other typical houseplants. Many orchids rely on complex relationships with their parent plants including symbiotic relationships with mycorrhizal fungal species in order for the seed to germinate. In the unlikely event that you do manage to purchase some genuine seed and wish to grow them yourself, there is another stumbling block. You will need access to laboratory equipment such as an autoclave and laminar flow hood, as well as good practical knowledge of aseptic (sterile) propagation technique. Orchid seeds are currently grown in flasks on an agar based medium. If you still want to get hold of a monkey face orchid then your best course of action is to contact your local orchid society. 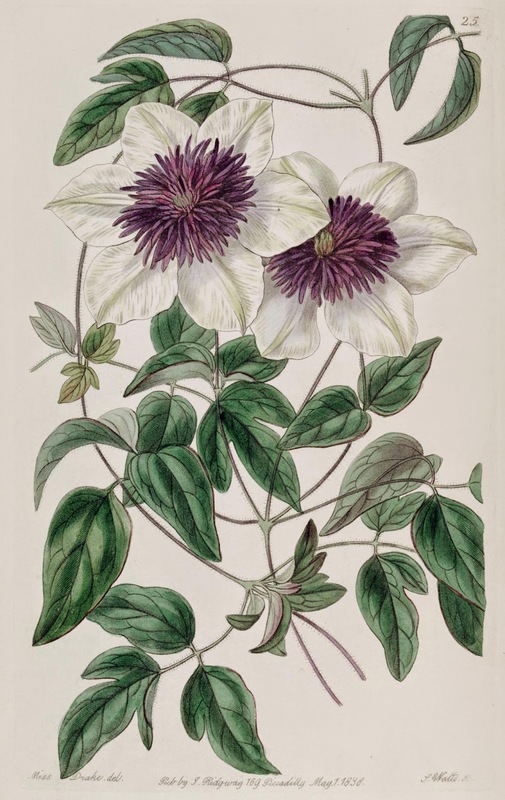 Clematis florida 'Sieboldii' is an extremely attractive, flowering climbing plant that was introduced to European gardeners from Japan in around 1836. 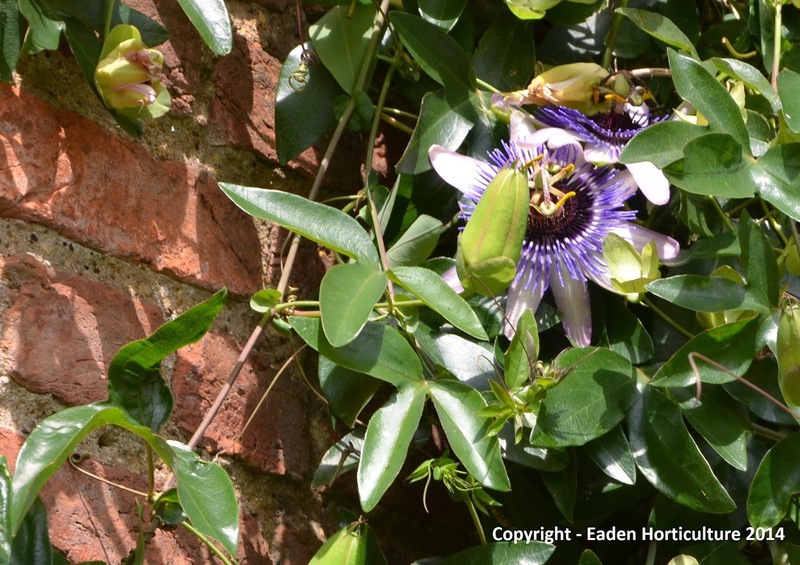 It bares a striking resemblance to the hardy passionflower - Passiflora caerulea but has a far more elegant flower and displays a less vigorous growth habit. They are considered deciduous but can be semi-evergreen in milder climates, however like other clematis they are fully cold hardy. 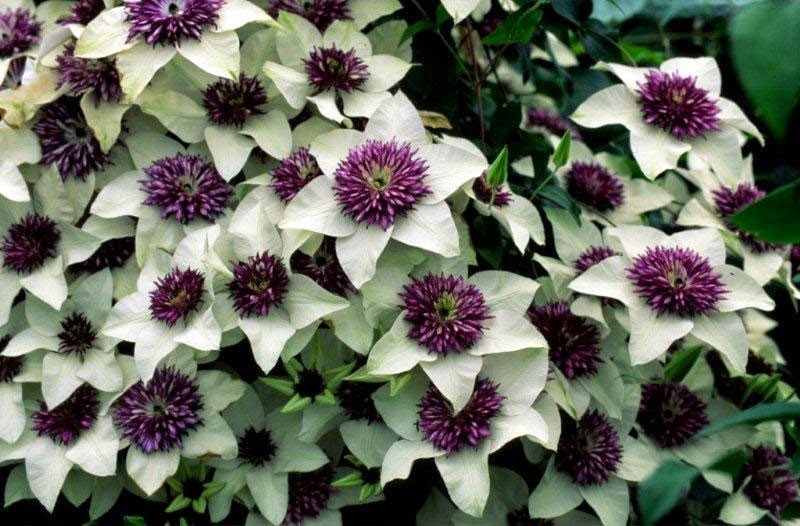 You can grow Clematis florida 'Sieboldii' both in the ground or as a container plant, either way they will need to be grown in a sunny, sheltered position. When pot grown use as large a pot as you can comfortably carry, and plant the clematis using a good quality, free draining compost. When planting in the ground Clematis florida 'Sieboldii' will be happy in any fertile, well-drained soil although they will prefer one which is slightly alkaline. Like other clematis species the roots like to be kept in cool shade. This can be provided by a dry mulch such as gravel or bark chips or position another plant near the south side of the roots. Apply a slow-release balanced fertiliser such as osmocote when planting new stock and provide a mulch of well-rotted compost or farm manure around the base of the plant in early spring. Established plants can be feed with a liquid fertiliser every 7-10 days and water over the growing period in their first year of planting. Established plants will only require watering over the hottest part of the summer, while pot grown specimens will need considerably more. Clematis florida 'Sieboldii' is relatively pest-free however they can suffer from aphids on new growth and the flowers can be prone to damage from earwigs. Luckily, unlike their cousins, the large flowering hybrids, they are not particularly prone to clematis wilt so it isn't really necessary to sink the root ball by 30 cm or so. Pruning is only required in the spring to remove dead or damaged stems. This should be done before the new growth appears. Cut back all stems back to a strong set of buds. Lobelia tupa is one of the class acts of late summer flowering plants, however they can be difficult to find and expensive to purchase. So if you want to grow your own you may be better off trying to propagate your own, but a word of warning. Lobelia tupa do not take well from cuttings, and neither do like to root from seedlings lifted straight from the ground. Your best bet is to grow them from seed. Lobelia tupa seedlings can be sown at anytime of year but you will make the most of the growing season if you start from November until February. 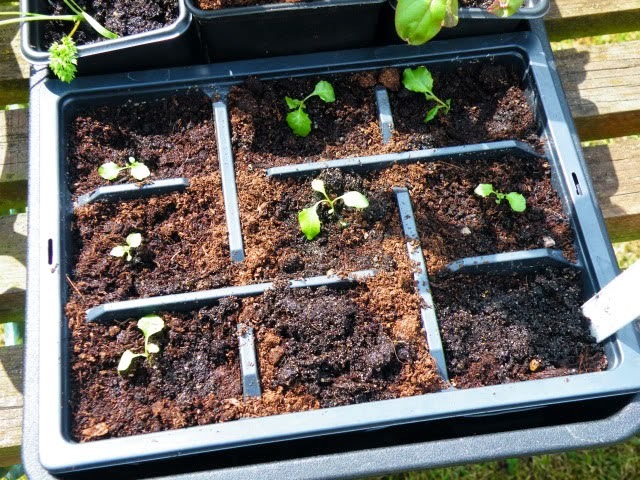 Using a modula seed tray, fill with a good quality free-draining compost such as John Innes 'Seed and cutting'. To improve drainage further you may wish to mix in a couple of handfuls of horticultural grit or vermiculite. Gently compact the compost and then water. Sow the seed at a rate if one per module and gently press the seed into the surface of the compost. Lobelia seed need light to germinate so either leave them as they are or cover with a thin layer of vermiculite. Put the tray in heated propagator 15 to 20 degrees Celsius, alternatively seal inside a clear polythene bag. Place the tray in a warm, bright room on a windowsill that does not receive direct light, or a shaded, unheated greenhouse. Instead of watering, mist everyday. You can expect the seedlings to emerge in three weeks or so. Once the first seedlings are visible remove them from the propagator or polythene bag. Once the seedlings are 3-4 inches high and well-rooted in the module they can be carefully lifted and potted on into 4-5 inch pots containing a good quality, free-draining compost. Grow them on for a month or so and then harden them off for a week or so before planting outside into their final position. If there is a threat of late frost then delay planting until the threat is over. 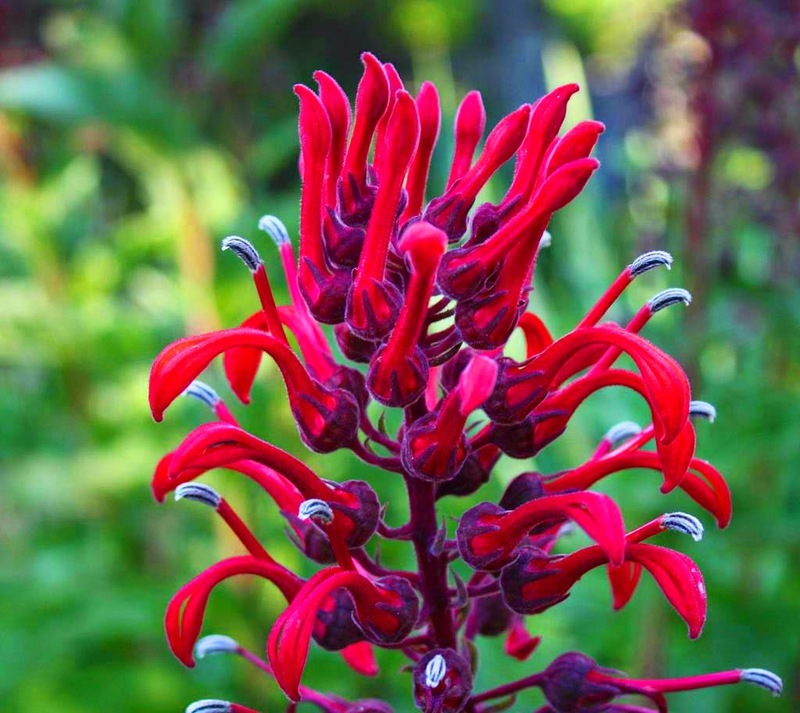 In northern european climates plant Lobelia tupa in a sunny, sheltered position in a well-drained and fertile soil. 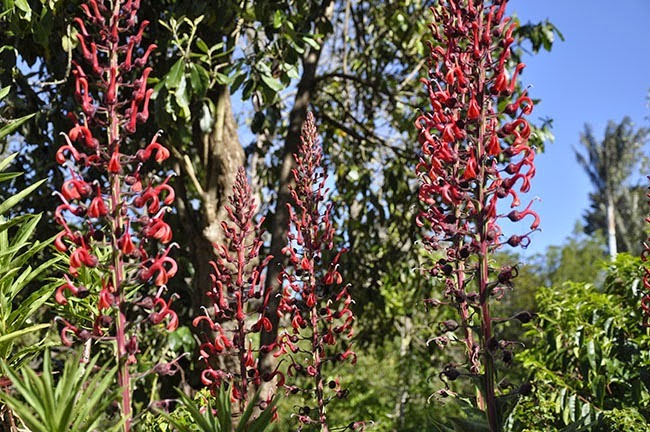 Lobelia tupa is one of the most impressive of all species within the lobelia genus. Native to central Chile and Peru it is surprisingly hardy and will even tolerate the milder climates of northern Europe. The Mapuche Indians of Southern Chile consider it a sacred plant. 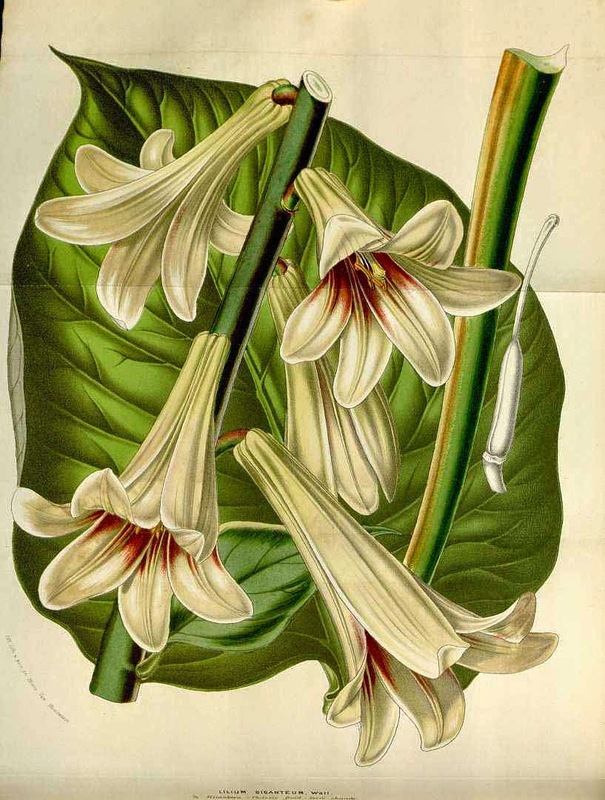 The latex is used as an abortifacient, and a hallucinogen, while the leaves are dried and smoked as an intoxicant. This would explain the plant's common name of 'Tabaco del Diablo', meaning 'Devil's Tobacco'. 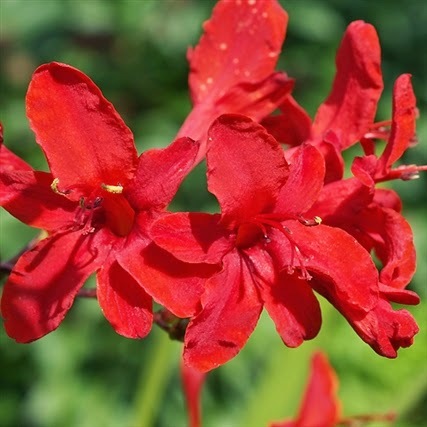 It produces the most stunning blood-red flowers which appear from late summer to early autumn, but these will come to an end with the first of the autumn frosts. It is an evergreen, woody perennial which can reach around 6 ft in height although they can be as tall as 12 ft in their natural habitat. 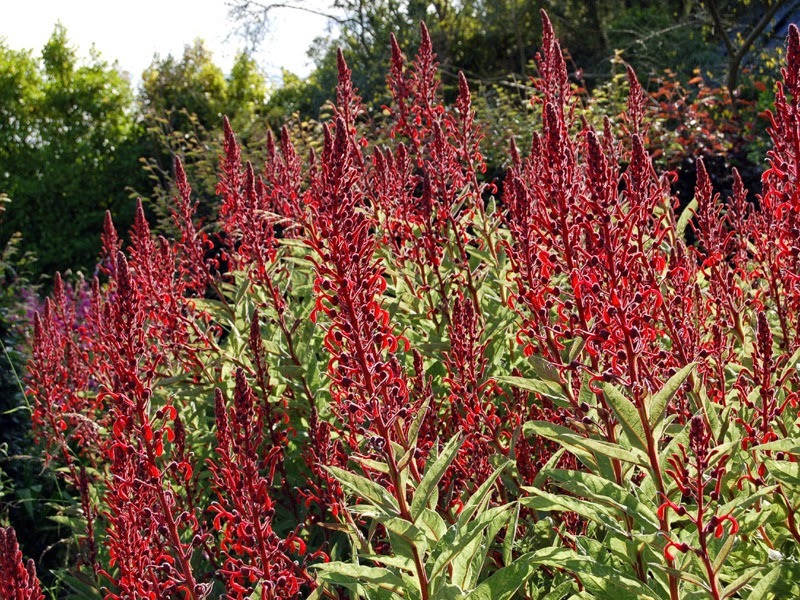 Lobelia tupa will require the shelter of a warm sunny wall and will do best in a moist, yet free-draining soil. It will also cope with a semi-shaded position and is also surprising drought tolerant once established. Overwinter Lobelia tupa can be left in place but with the roots protected with a dry mulch such as gravel or more preferably bark chips. Alternatively it can be lifted and potted on, then overwintered in a cool greenhouse or frame until the following spring. Once the threat of late frosts have passed it can be planted outside once again. Native to tropical and subtropical areas worldwide Crinums are not known for their hardiness, however if you live in a northern European climate and fancy growing these gorgeous plants in your garden you are in luck as there is one cultivar than you can leave to over-winter outside - Crinum x powellii. 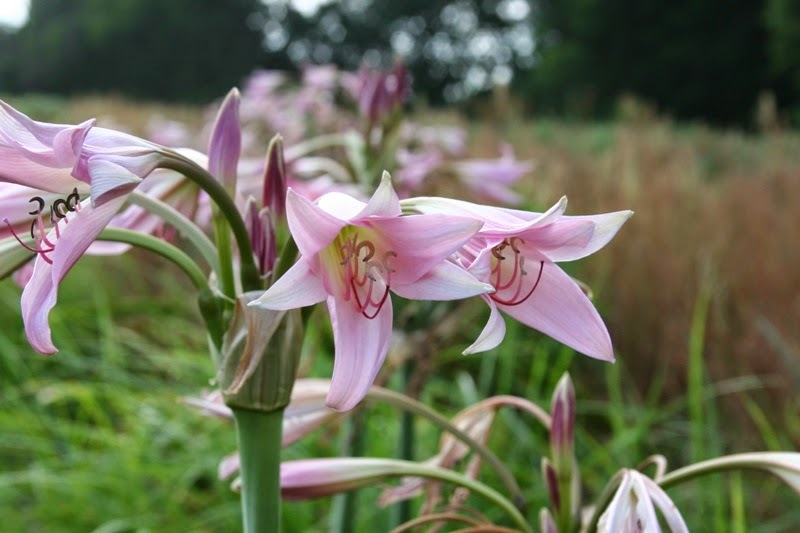 Crinum x powellii is a hybrid of Crinum bulbispermum and Crinum moorei both species native to the cooler regions of South Africa. Seeds should be sown singularly as soon as they ripen. Using 3 or 4 inch pots, fill with a good quality, well-drained compost mix such as John Innes 'Seed and Cutting', you may need to add some horticultural grit or perlite to improve the drainage further. Make a small depression in the surface of the potting compost and place the seed in the depression. Do not cover the seeds as they require light for germination. It is not important which side up the seeds are placed on the compost. Gently water using a can with a soft hose and place in a heated propagator at approximately 21 degrees Celsius. Alternatively seal in a clear polythene bag and place on the windowsill of a warm bright room, but out of direct sunlight. Keep the compost moist but not waterlogged. After several weeks, the first embryonic roots should emerge searching for the soil. Four to six weeks after that, the first green shoots should appear above the soil. Remove from the propagator or polythene bag and keep in a warm bright area potting on as required. Keep under protection for the first winter, reducing the water as the temperatures lower. Plant in April or May once the threat of late frosts have passed in a rich, well drained soil. They will do best on a sheltered, warm, south-facing wall, water freely over the summer. 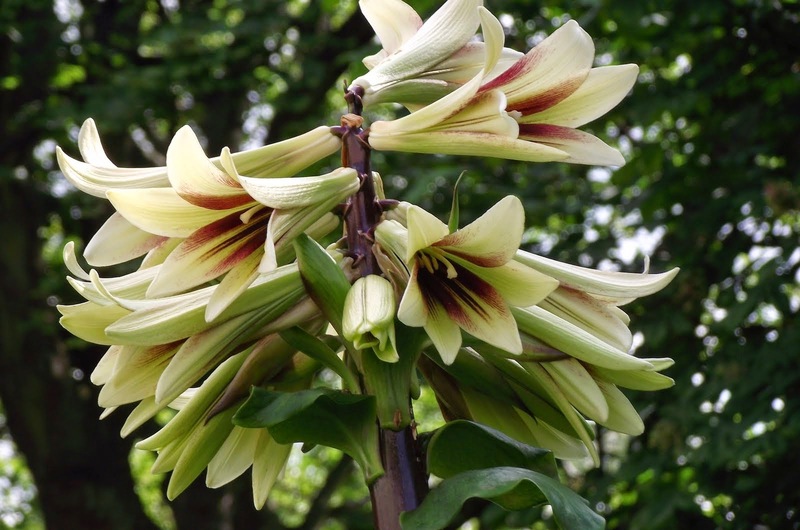 The Cardiocrinum giganteum is truly a king amongst lilies. Commonly known as the giant Himalayan lily, it towers head and shoulders above all other species within the liliaceae family reaching an impressive 3.5 metres in height. Native to the himalayan regions of of India, Tibet, Nepal, Bhutan, Pakistan, China and Myanmar (formerly Burma), this impressive specimen is surprisingly hardy and will grow quite happily in the gardens of northern Europe. 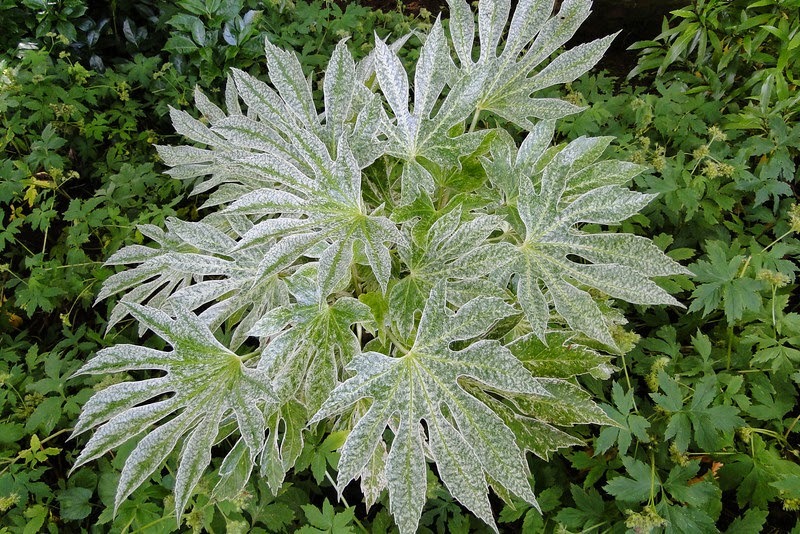 As big as it may be it will need to be kept in a sheltered location under dappled or semi-shaded conditions, it is particularly intolerant to exposed, sunny positions as the dark-green, heart-shaped leaves will easily scorch. 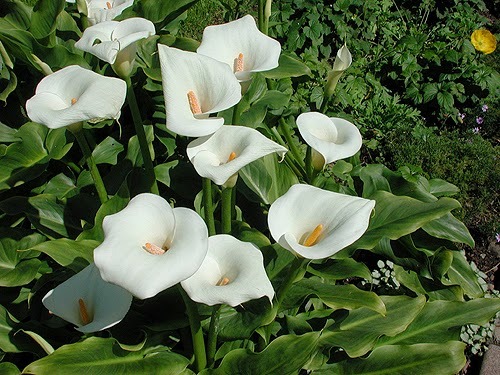 The giant Himalayan lily will do best in a moisture retentive, but free-draining soil. With such a large growing species preparation is all important. Plant mature pre-packed bulbs in October while pot-grown specimens can be planted at anytime of year. Just try to avoid damaging the root system when planting. Dig a decent sized hole and then backfill and dig in plenty of leaf-mould and well-rotted manure to the spoil. When planting pre-packed bulbs make sure that the 'nose' of the bulb is set an inch or two just above the soil line. With pot grown specimens keep the soil level at the same point as it is in the pot. Water freely during dry periods and apply an annual mulch of well rotted farm-manure in the spring. Despite their enormous height, they do not require staking. 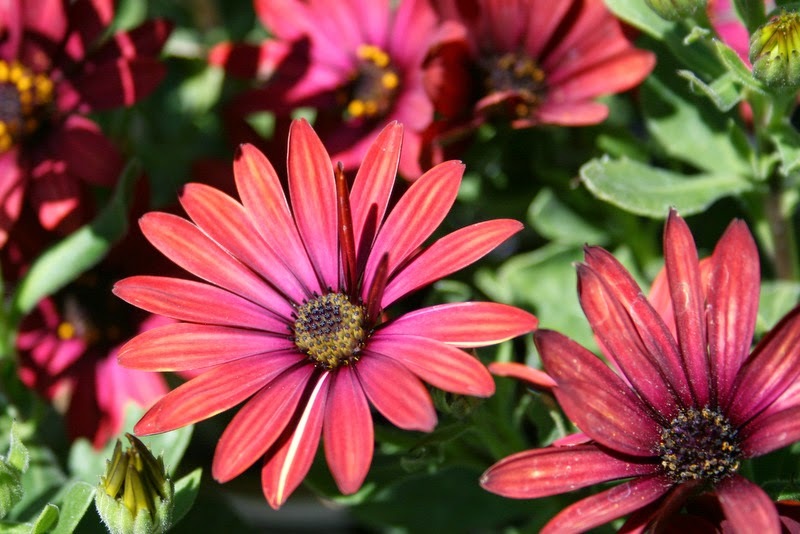 How to grow Osteospermum from seed? Osteospermums are a fantastic addition to the summer garden, and yet they are relatively new to most gardeners and were almost unheard of 25 years ago! While they are technically half-hardy perennials or subshrubs they are generally grown as annuals even though they will quite happily overwinter in a bright, frost-free environment. Be that as it may hardier species are available to purchase (Osteospermum 'Lady Leitrim' and 'Paleface') and these can tolerate temperatures as low as -13 degrees Celsius! Native to Africa and the southwestern Arabian Peninsula, these large showy, daisy-like flowers are available in a wide range of stunning colours white, cream, pink, purple, mauve to yellow and even a deliciously hot red. A few cultivars are even more ornamented with spooned-shape ends to the petals such as "Pink Whirls". Many of the species will have a second flowering over the late summer, stimulated by the cooler night temperatures. The hardy species will flower profusely spring, but unlike their less hardy cousins will not produce a second flush of flowers later on in the year. As gorgeous as osteospermums are they can be expensive to buy, however they can be grown from seed. 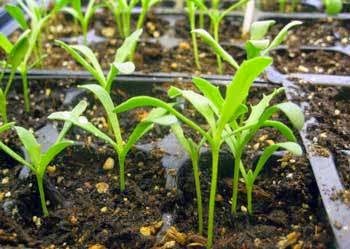 Just be aware that if you collect your own seed the resulting seedlings are unlikely to grow true to the parent plants. You can either propagate from these vegetatively, or purchase pre-packed seed from a reputable company. 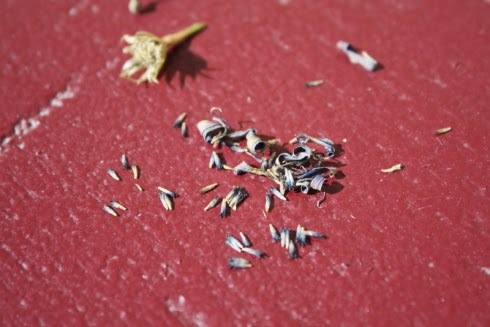 You can sow osteospermum seed in the early spring. Fill a modular seed tray with a good quality free-draining compost such as John Innes 'Seed and Cutting'. Sow the seed at a rate of one seed per module and then cover with a light sprinkling of perlite or vermiculite. This is because osteospermum seeds require light for germination. Water gently using a can with a soft rose, or carefully dunk the tray into a container of water allowing the water to naturally rise through the soil. Do not submerge the tray. Allow the tray to drain and then seal inside a clear polythene bag. Place on a warm bright windowsill but out of direct sunlight. 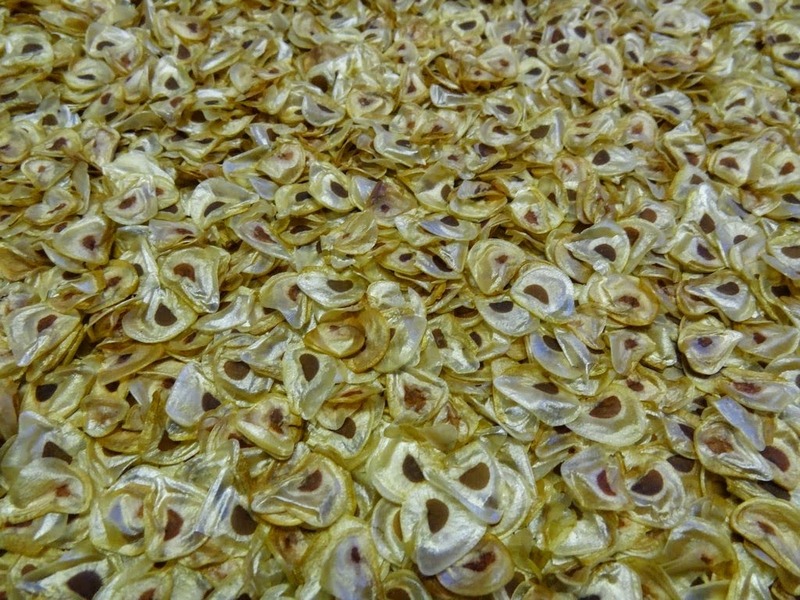 You can expect the seedlings to emerge after only 10-15 days at 15-18C at which point they can be removed from the bag. keep the tray on the windowsill and allow the compost to remain moist but not waterlogged. Once the seedlings have rooted well in their module they can be lifted and potted on into 3 inch pots and grow on in cooler conditions. They will need to be gradually acclimatized to outdoor conditions for 10-15 days before planting out into their permanent position but only on all threat of frost has passed. They will do best in a warm sunny spot on light, well drained soil. If you are planting them in groups, grow them 12 inches apart. Osteospermum file is licensed under the Creative Commons Attribution-ShareAlike 3.0 License.